I like from time to time to read my old blog posts, from the very beginning of my blogging past or from several months ago, because I can see what was happening to me at that time and what changed and how I changed overtime. I've been having an urge recently to create something. A piece of art. Not like Picasso piece of art, of course, not something big that will sell immediately and will be remembered forever *^v^*, but the art as opposed to something useful. A bag I sew is an useful item, a skirt, a choker, a knitted scarf - these are all items to be used. And I enjoy making them, I always have and I always will. I fight with myself because one part of me says that it's a waste of time to make something that cannot be physically used. But on the other hand I would like to just sit for an hour or two, over the piece of paper, with a pencil and paints, (yes, that's something I more or less can do - draw), switch off my mind and let the fingers do the work. Or maybe do something with pieces of fabrics, turn them into a quilt-picture? I also changed my way of thinking about the products I create for the galleries - I used to think about them in a categories: "they will/won't sell, they're potentially profitable". Now I am more inclined to think "I enjoy making these items, they're cute, I like them so others may like them as well and buy them". 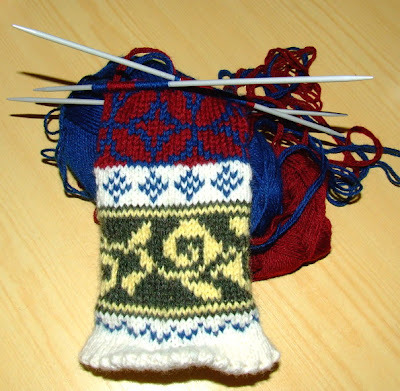 I started my Tiffany mittens and when I reached the palm I chose dark blue and maroon. How come those two colours look so beautiful when placed side by side in skeins, but they look so awful mixed in this intricate pattern? Okay, at least to me they do. 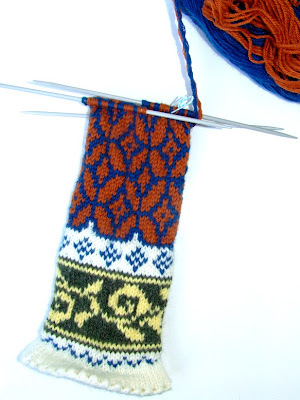 I knitted several rows and then started to have doubts, stopped and thought about it, and frogged! Congratulations for selling your paintings! And there is a buisness side and a "happy creating side" of art I think, maybe one don't have to choose? Hopefully it can be both, I'm voting for you! it must make you proud to look back after a year and see that you are doing what you wanted to do!! Yay for you!! Have fun at the Hot Chocolate Cafe. its so wonderful when you can monitor and see how much progress youve already made...keep on with your goals! good luck and dont give up now! krissie f rom message in a bottle blog - cant be bothered logging in today! !